For those who have not sailed Carnival before here are some tips! 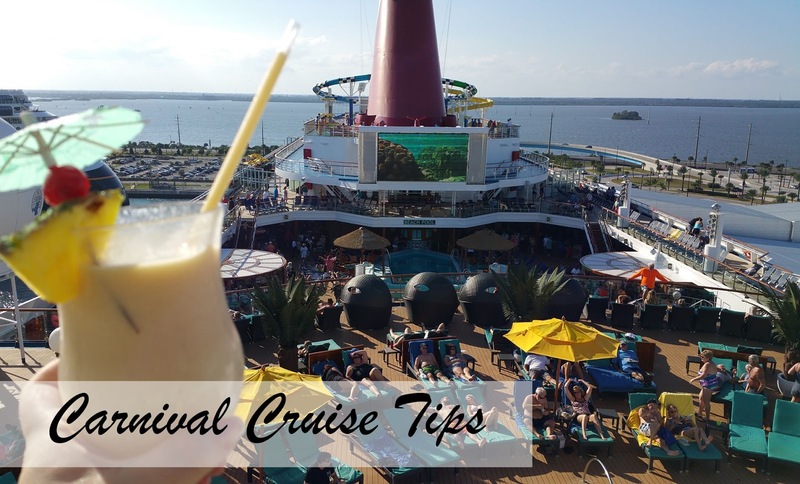 I have just finished my 10th Carnival Cruise and have learned these tips from some of Carnivals loyal cruisers who have become my friends! If you have any other tips I should mention feel free to comment below! You can bring a 12 bring of soda or water on board per person. You just need to have it on you during security. Do not check it with your luggage. You can also bring on 1 bottle of wine per person on board. Once again just make sure you have it with you and not in your checked luggage. You can also order water, soda, welcome gifts, wine, and booze from bon voyage. Here is the link! They started selling a 12 pack of water for $2.99 $4.50 which is great and worth the little bit of higher cost since you will not be lugging water around when checking in. All the way forward on decks 6,7, 8, and 9 on most ships but the fantasy class is what people call secret decks because no one ever really goes outside there. You may feel like you should not open the door on those levels but go ahead you will see the view the captain gets! It might be windy at times but it is so peaceful and at night is so dark you can see the stars! Carnival has beach towels in your room upon arrival and they will give you new ones everyday if they are dirty. All you have to do is just leave them in a pile where they can exchange them for you. Like most cruise lines there is shampoo and body wash in the bathrooms but no conditioner so make sure to pack some! There are hair dyers in every room and if there is not just ask your room steward. They are located in one of the top drawers by the mirror in your room. There are not many outlets in your stateroom so bring an extension cord or a power strip and that will solve all plug problems. There are laundry rooms on the ship if you want to do laundry or iron clothes. Personally, I usually send a bag that will be in your room of laundry out at least once during the cruise. I am there to have fun and not wait for laundry! A bag to wash is about $16 dollars and they will have it back to you by the next day! They will also do dry cleaning and ironing but I am not sure on that price since I have never done it! If you have a mini bar in your stateroom and you want it emptied just tell your steward and they will take everything out for you so you do not have to have the temptation. You can store your own soda and water in there. It will not keep them cold but chilled. If you are a cold drink fan like me and love everything with ice just tell your steward when you get to your room that you love fresh ice in the morning and night. I like to get their big buckets in the beginning that they use for champagne or beer and have it full of ice and have my water in it cold at all times! If you have a lot of small stuff that you want organized and easy to reach pack a over the door shoe holder for the bathroom door. Make sure of course it is the one with the clear pouches so you can find everything easy from aspirin to hairspray or makeup. It really safes so much space! While the closet space is great most people cut of their closet space with luggage. To solve this problem just slide your luggage under the bed! Easy! Carnival does a good job on the ship with hand sanitizers but I always pack my own and bring the travel sized Clorox wipes and wipe down the place when I enter the stateroom. They do a great job cleaning but I am germaphobic so the ease of cleaning all the knobs, lights, handles, and phone, makes me feel better. Always wash your hands and sanitize! While they do an excellent job cleaning remember you are in a confined environment where germs can spread like wildfire! Remember to buy sunblock, lotion, and pain relievers before you get on the ship otherwise they charge a pretty penny! I really do hate buffets and usually stay away from it because of my germaphopia. Yuck! But on the last day lunch they do a chocolate buffet for desserts and it is pretty good! On the topic of buffets I always eat in the dining room for the sea day brunches. They are very good. In my opinion better than going to the buffet for breakfast.